In the early, anti-diluvian period of cell culture media development, cell densities in the hundreds of thousands or millions per mL were regarded as notable accomplishments. Those times are long gone as investigators look to optimize conditions for growing cells to densities many times higher, in the stratospheric range of 100 million per mL, a performance critical for efficient upstream processing. Achieving these lofty heights requires the hand-in-glove integration of cell- cultivation hardware with the specific medium targeting the cell line. In a recent Sartorius Stedim Biotech Upstream and Downstream Technology Forum, investigators presented their experience in building platforms for cell, viral, and bacterial production systems. 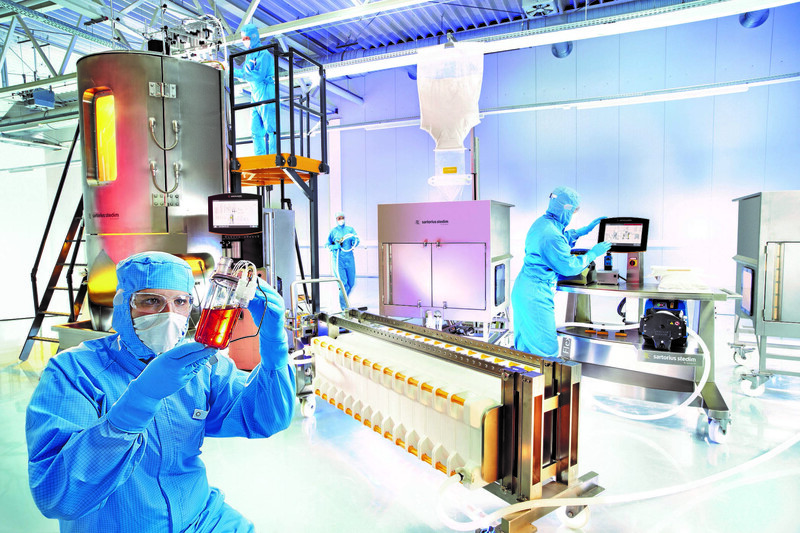 The generation of and access to mass data based on multiparallel process development methods is coming to dominate upstream and downstream processing, according to Oscar-Werner Reif, Ph.D., CTO at Sartorius Stedium Biotech. Heather Nunn, Ph.D., a research scientist at Amgen, presented her team’s approach to improving production levels of monoclonal antibodies, using the Sartorius ambr® 250 system. This is an automated, multi-parallel perfusion bioreactor system for cell-culture process development and process optimization studies. It supports a range of hollow-fiber cell-retention applications, with up to 24 fully single-use perfusion bioreactors in parallel. This step change in perfusion process development capability optimizes the application of intensified cell-culture processes, and may lead to lower production volumes and reduced cost of goods. Dr. Nunn’s team focuses on monoclonal antibody production as a high-density process. To build a viable model that will allow accurate scaleup, a substantial body of data must be produced, including O2 and CO2 production, and temperature variation. Large bodies of data require data management systems, a permanent component of the optimization process. “We want our model to be predictive, to be a robust, reproducible picture,” Dr. Nunn pointed out. “Understanding is the important thing. By looking at the efficiency gains we can develop a detailed cost model for consumables. Continuous bioprocessing is seen as a means to maximize efficiency in bioprocessing operations, allowing more compact facilities and minimizing scale-up risk, while simultaneously producing more consistent product quality and higher throughputs. All of these factors will result in notable cost savings, as Gerben Zijlstra, Ph.D., platform marketing manager, continuous biomanufacturing, at Sartorius-Stedim Biotech in the Netherlands, described in his presentation. 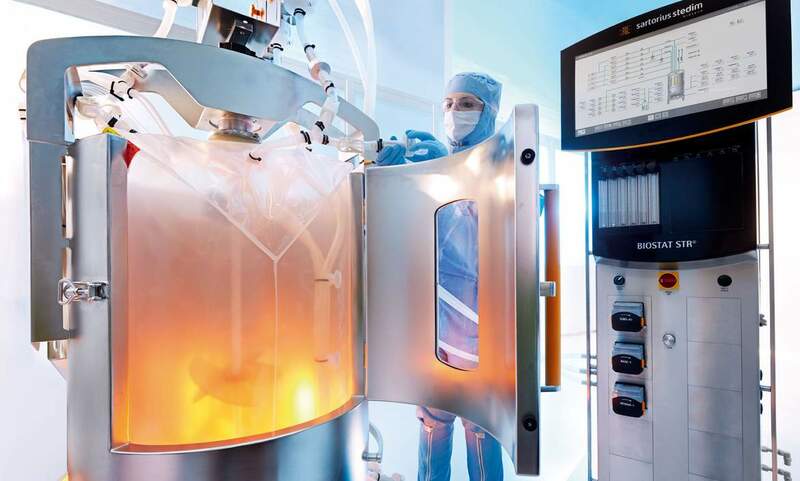 Notwithstanding its notable advantages, there are unresolved technical challenges in developing a platform of intensified and continuous bioprocessing. High-throughput tools for building these platforms are limited, and single-use bioreactors are not configured to support the required high cell densities. While increasing cell densities to greater levels can result in substantial cost savings, it also presents difficulties in handling and processing. Additionally, cell-retention systems are costly and processing of extremely high cell-density cultures poses substantial challenges. Dr. Zijlstra explained that there is a hybrid continuous option adopted by some companies that can avoid some of the barriers presented by a fully intensified and continuous bioprocessing option. In this case, only the upstream or part of the downstream process is operated continuously. Some companies may operate a perfusion bioreactor in combination with a batch- purification process and others that operate a fed-batch bioreactor with a continuous chromatography capture step. Fully continuous and automated processing even allows a single-use facility to be set up in one room, as a portable facility. There are many examples of bringing the operations down to a much smaller level with substantial cost savings. However, these improvements on the upstream end will require compensations at the downstream end, for example, by increasing the binding capability in order to handle increased requirements of protein capture. As referred to in Dr. Zijlstra’s presentation, pushing production to high cell densities offers advantages in terms of cost and resource savings, but it also introduces high levels of protein and DNA into the cultures, which can compromise the cell culture clarification process. Detlef Eisenkraetzer, Ph.D., director of fermentation development at Roche Pharma, discussed the use of Sartoclear Dynamics as an alternative to gravity-based clarification methods. The adoption of this technology proved to be a rapid and efficient approach to removing high loads of interfering macromolecules, according to Dr. Eisenkraetzer. Dr. Cayli describes Florabio as a life science company focused on developing proprietary cell-culture technologies, drawing on their experience in manufacturing therapeutic proteins in the most economical and expeditious fashion. Dr. Cayli explained that it was necessary to move beyond obsolete protocols developed years ago by the vaccine industry, and to design culture media optimized for each specific cell line, which has been previously engineered for robust vaccine production. Florabio media are serum free, animal-component free and contain no growth factors or other undefined components; therefore, production batches are reproducible. Drawing on their years of experience with vaccine production, the Florabio staff gradually adapt each cell line to the the appropriate high performance media. He recommends that customers acquire their technology as a package, with the cells, media, and bioreactor process combined as a platform. By taking advantage of this option, Dr. Cayli predicts that vaccine producers can ramp up their level of productivity by almost 10-fold. Looking at future trends, Dr. Linz said it is clear that the need to develop innovative pharmaceutical products, especially biologicals, will continue to grow. As the developing world pursues the lifestyles of the more advanced countries, the incidence of cancer and cardiovascular disease will increase, as will the market for drugs to treat these conditions, he noted. K. John Morrow, Jr., Ph.D. (kjohnmorrowjr@yahoo.com) , is president of Newport Biotech Consultants.